Ownership / Access: Wedding venue. Notes: Cooling Castle is a 14th-century quadrangular castle in the village of Cooling, Kent on the Hoo Peninsula about 6 miles (9.7 km) north of Rochester. It was built in the 1380s by the Cobham family, the local lords of the manor, to guard the area against French raids into the Thames Estuary. The castle has an unusual layout, comprising two walled wards of unequal size next to each other, surrounded by moats and ditches. 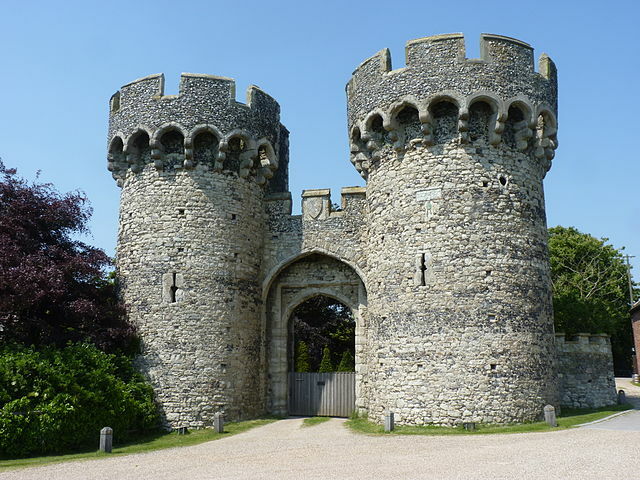 It was the earliest English castle designed for the use of gunpowder weapons by its defenders. Despite this distinction, the use of gunpowder weapons against the castle proved devastating. It was captured after only eight hours when Sir Thomas Wyatt besieged it in January 1554 during his unsuccessful rebellion against Queen Mary. His attack wrecked the castle and it was subsequently abandoned. A farmhouse and outbuildings were constructed among the ruins a century later. Today the farmhouse is the home of the musician Jools Holland, while the nearby barn is used as a wedding venue.